If you share your space with a pup, you’ve likely purchased a bed for him—even if he still insists on sleeping in yours. But in 2017, third-generation woodworker Jordan Dowell introduced a piece of furniture he affectionately calls a canine credenza ($1,900–$2,200), a piece that is as much for you as it is for Fido. 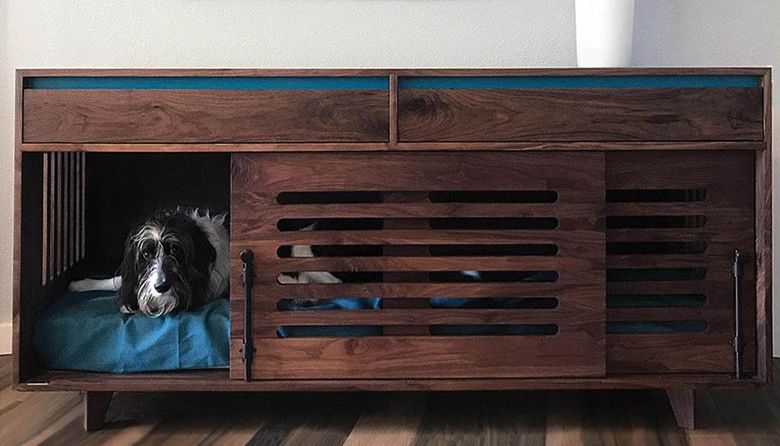 The credenza, fashioned from locally sourced black walnut and with a waterproof finish made of natural tree resins and beeswax, is both dog crate and storage solution, especially useful in small living quarters. Dowell and his wife, Melissa, with their miniature boxer, Luna, run boutique furniture company This Is Urban Made (Fremont, 3511 Interlake Ave. N). His canine credenza has ventilated, sliding doors that open to a platform suited for dog beds, but also bolts closed for crate training. Cats needn’t get all the fun hiding spots.